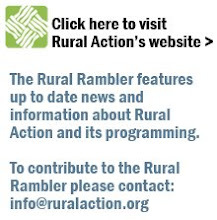 The Rural Rambler: DJ For A Day? The Adventure Auction Approaches! DJ For A Day? The Adventure Auction Approaches! The Adventure Auction is less than a week and half away. The auction will take place on Saturday, April 24, 2010 from 6:00-10:00 p.m. at the Hocking College Student Center. Some of the adventures you could win this year are a five-course seafood dinner with wine pairing for six, one-week stays in: a Parisian apartment, a Hilton Head Townhouse, and a South Carolina cottage , as well as massage and wellness packages, paintball, zipline passes, local food products and much more! Get your tickets today by visiting: www.adventureauction.org. Rural Action members and members of the Giving Society can purchase tickets at a discounted rate. If you have questions or would like to purchase tickets over the phone, call: 740-767-4938. At last year's Adventure Auction, Michelle Greenfield won the Power 105 "DJ for a Day" package. The package included three hours on the air with the A-News "Best DJ" two years running, Robin Barnes. Michelle says that she, her husband Geoff and her two children all enjoyed the package very much. Michelle arrived at the Power 105 studio at 7 a.m. one morning last spring. Power 105 broadcasts out of an inconspicuous building on Columbus Road in Athens. What you don't see from the outside, or hear over the radio, is all of the equipment that's needed to actually put the show on-air. Each person in the studio is fitted with a bulky pair of headphones and talks behind a large microphone. There are plenty of dials and sliders to play with, and the whole broadcast is controlled through a PC workstation. Needless to say, it can be a little difficult trying to sound conversational when you're surrounded by equipment. "It seems like a fun job to do," says Michelle, "but you get behind the microphone, and it's just not what you were expecting! I never realized all the things that go into a radio broadcast. Robin was putting together a playlist, queuing up commercials, preparing her features and talking live all at once. I was a little nervous at first, but in the end the time just flew by." Michelle got to share the experience with her husband, Geoff and her two boys Aidan (11 yrs. old) and Robin (13 yrs.). "The boys loved it. They came down before school started and actually got behind the microphone and dedicate songs to their friends." Michelle and Geoff own Third Sun, a local company specializing in green energy installations. "I take care of marketing and public relations for Third Sun, so I had a little experience already with public speaking, and the DJ package sure gave me some great practice! Overall, I'm really happy to have won the package and share it with my family!"